This sprawling member of the Pea family is widespread in the Mediterranean region, but absent from most of the islands. 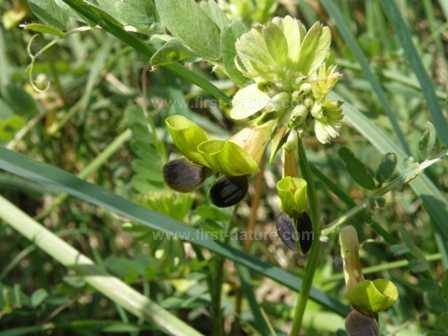 The flower and leaves of this plant make it easily recognisable as a member of the Pea family, but the colours of the flower are most unusal and exotic. The leaves are arranged in oblong pairs of leaflets, and the flowers are greenish-yellow with an almost black keel. Vicia melanops grows on roadsides, in the garrigue, in grassy locations, and also amongst bushes and shrubs which it uses as a support over which to scamble. It flowers from March until June. The plant shown on this page was photographed in the Gargano region of Italy in mid-April.